Are pirates' heads about to explode? Thom Yorke has sympathized with fans who pirate his music in the past, and now the Radiohead frontman is taking advantage of those pirates' favorite tool: torrenting. The artist's latest solo album, Tomorrow's Modern Boxes, is the first BitTorrent Bundle that will be partially locked behind a paywall. Yorke, whose first name is definitely pronounced "Tom" despite how it looks, said in an announcement that the album release is "an experiment." 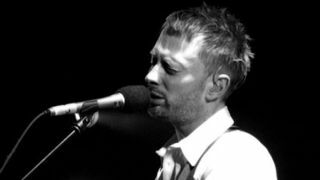 He and producer Nigel Godrich want to see if the Yorke-loving music populace "can get its head around" the new business model. Previous BitTorrent Bundles let torrenters have a free taste of some content and unlock the rest by providing an email address or an optional monetary "donation." BitTorrent's Director of Communications Christian Averall said in 2013 that the company wants to "make the transaction easier" between artists and consumers. Yorke fans will be able to download a single track and a video from the new album for free, but the singer will require more than an email address to cough up the rest. Thankfully $6 (about £3.70, AU$6.85) isn't a lot to pay for an entire album. In this initial test of BitTorrent Bundle paywalls the artist handles the transaction and keeps 90% of the money, with the other tenth going to BitTorrent itself, and users have a limited number of downloads per transaction. If people buy in and the "experiment" proves fruitful, more artists could go this route and provide fans with a cheap, easy way to get what they want through established technological channels.